Don’t ask me to tell you my favorite beer. I don’t have one. I probably have 20. But favorite brewery? Piece of cake. The Bruery. I discovered The Bruery one night years ago at Zeno’s Pub in State College, PA. It’s a dimly lit basement bar that always offers a stellar selection of bottled and draft beer, and they often have a few harder to come by beers for the area. A yellow logo from “The Bruery” is artfully painted on the cement stairway wall leading down to the Zeno’s entry. I noticed the logo, wondered why someone couldn’t come up with a more creative name for a brewery, and my husband (then, boyfriend) and I then promptly ordered a beer of theirs. The Trade Winds Tripel. This wasn’t your average beer. I just remembered it had a spark – something redeeming about it in comparison to all the rest. We sought out The Bruery’s beers again. And again. I don’t know what beer we found next or where we found it. But quickly, these beers became ones we sought out. I remember finding 5 Golden Rings at Beer Run in Charlottesville, VA. I read the description of the beer, thought it sounded unique, and bought two bottles. It’s a golden ale with cinnamon, ginger, allspice and pineapple. I didn’t know anything else about the beer aside from the fact that I longed for it to be an adequate food to beer replacement of pineapple upside down cake. It didn’t disappoint. 5 Golden Rings? 5 golden stars on Untappd. I read the bottle label and discovered that this beer wasn’t just a line pulled from a song. This beer is one of 12 in the Twelve Beers of Christmas series. A new beer from the series is brewed every year, never to be brewed again. What’s really cool about this series is that all of these beers are ageable and designed to be good through 2019, the year the final beer in the series, 12 Drummers Drumming, is released. Now we’re entering the fan zone. Ben and I successfully sought out the previous years’ beers from the series the other year. We paid more for a few bottles of Partridge In A Pear Tree than we’ve ever paid for a bottle of beer before. You can find bottles online from those lucky enough to have purchased a lot for around $250 a bottle today. Ben joined the Preservation Society, which is one of The Bruery’s exclusive, special release beer clubs. This one gets you 3 of these exclusive beers every quarter, hand-picked by The Bruery. There’s also the elusive and highly-coveted Hoarders Society, which is an ultra-exclusive, invite only group with access to even rarer beers! Ben and I aren’t a part of that yet! But if ever an invitation were to appear in my mailbox, people would probably mistake my reaction for that of someone who just won a million bucks on a lottery ticket! But why go to all this trouble (and expense) for beer? The answer is really simple: Because The Bruery goes to great lengths to brew the best beer and to make it exactly what they want it to be. These beers embody passion. They embody everything beer should be. These beers aren’t your safe IPAs or your easy stouts or simple pilsners. These beers are meticulous works of art and they define “labor of love”. Brewers don’t make beer. Yeast makes beer. And yeast won’t always do what you intend for it to do. The same goes for certain bacteria used in sour beers. 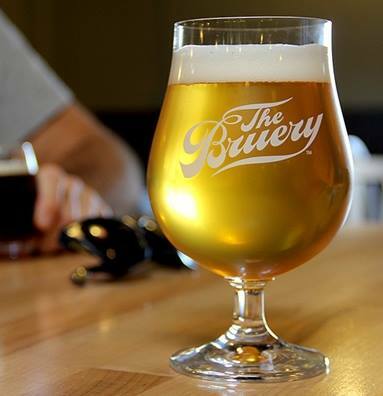 The beer that The Bruery produces is a living thing, as their beers are bottle-conditioned, allowing residual yeast and sugar in the bottle to maintain carbonation and continue to develop the beer, making it great for aging. The Bruery brews some sour beers, along with some really high ABV beers. Extremely high ABV beer is harder to produce, as yeast find it harder to survive as the ABV continues to climb. And in regard to sours, great care must be taken to avoid contaminating non-sour beers with the bacteria used for souring. On top of that, barrel-aged beers in themselves are a risk. A barrel-aged beer is monitored and tasted often. There’s no set time frame for when a barrel-aged beer is ready. Sometimes, the beer seems to be on the right path, and at the next tasting, it’s discovered it’s taken a wrong turn and must be dumped. The Bruery could easily avoid these risks and play it safe by making your run-of-the-mill, everyday beers. It would cost them a lot less money and save them from having to dump out or refund hundreds of thousands (if not millions) of dollars worth of beer. Recently, a slated beer called So Happens It’s Tuesday was bumped from the roster. The Bruery emailed the Reserve Society members who were to receive this beer, and explained that they had an issue with the beer that caused it to not live up to their standards. Rather than just sending us the beer anyway, the folks at The Bruery announced that they would be refunding us for the beer. I fully respect and appreciate choices like that. They have high standards, and instead of still trying to profit off of these beers when the standards aren’t met, they take a loss. That speaks volumes about what beer means to these beer geeks. There’s a lot of risk involved in brewing. The Bruery takes risks other breweries aren’t always willing to take. And in my opinion, the risk-taking is half of what makes their beer so great. With great risk comes great reward! The other half of what makes beer so great is complete and utter passion, knowledge, and respect for beer. This further solidifies the fact that The Bruery really is the best of the best. You really need to dedicate YEARS of your life to obtain the knowledge to become a Master Cicerone. THAT is love. I’ve literally given more than 80 percent of their beers 4 stars or more on Untappd. No other brewery comes close to that for me. These are the beers we break out for special occasions. These are the beers we share with friends (and honestly, strangers a time or two). We always have a bottle in the fridge ready to be called to action. And beers from The Bruery take up more real estate in our beer cellar than any other brewery’s beer. Ben and I have a ton of beer sitting out there in California from last year’s Reserve Society membership allocations, as well as some that’s been accumulating for this year’s memberships. So guess what that means? A trip to The Bruery is in store for us at the end of March!!! I can’t even contain my excitement. I think the beer I’m most excited to try is a beer inspired by limoncello called Sourrento, a sour blonde ale aged in oak barrels with lemon zest and vanilla beans. So if you ask me about my favorite beer, chances are you’ll always get a list. But if you want to know who I think produces the best beer out there? Just share a beer from The Bruery with me, and you’ll understand why it’s number one in my book. Great post! This is my first year as a reserve society member! I’m excited. The sourrento is amazing btw! Awesome! Good to hear! Cheers, Alfredo!